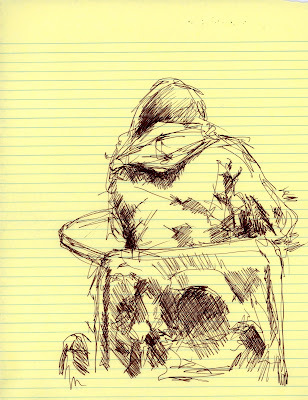 Girl Studying -- pen drawing on legal pad at the coffee shop in February. Sometime last year, Diahn and I decided that we really should at least TRY entering some work into shows, galleries, etc. We had one major hurdle, though -- no Artist's Statements! Yep. That was our biggest problem at the time. Everybody wants an artist's statement to accompany any work that is submitted. Sounds easy, doesn't it!? We read about how to phrase the artist's statement, happy with the advice that the wording should not be too "artsy" or esoteric, but short, simple, and direct. Later, of course, we were mightily confused when we read actual examples of artist's statements. I'm pretty sure now that we just got a hold of a bad batch of the things to begin with, but quite frankly, folks, some of these statements were just weird. Intimidatingly weird. They were about resolving social issues, political revolt, and dangerous furniture. I kid you not. And these people would never kid you -- they are some Serious Artists. At our mid-February coffee meet-up I told Diahn, "I can't write an artist's statement because I AM NOT AN ARTIST." I meant it. Really. It was making me feel like THAT. Smart girl that she is -- good friend that she is -- Diahn reached over, pulled the legal pad out of my hands, and said, "STOP." She officially absolved me from writing an Artist's Statement. I immediately felt better, and I feel better still. "If I see something that makes me happy -- I chase it down and I draw it. "When I see something that makes me smile, or makes me catch my breath for a second -- I sit down and paint it. "Usually I paint the places, people and things that I know. "Sometimes I paint the places, people and things that I wished I knew better. "I do it because it's fun, it makes me happy, and BECAUSE I WANT TO. Today is the second anniversary of this blog. Little did I know, when I first started it, how much fun it would turn out to be, and what a wonderful way it was to interact with people of like mind. Thanks to all of you who visit regularly, despite my erratic posting pattern! Thanks to all of you who visit only occasionally! And it this is your first visit, thanks to you, too, and I hope you come back! Later on, when I get my thoughts together, I plan to discuss my "2-year slump", and how comments from the group at EDM along with conversations with Casey and Diahn have helped me recognize a pattern that I hope to break. There's not time now ... the weekend is upon us! Let's all go do something fun! I finally finished the Queen Anne's Lace painting (my WC teacher has it to photograph, so I can't post the end result yet) and I just couldn't deal with any more green. BADLY needing some color, and having some photos with me from Bonny's trip to Italy, I decided to "visit Venice." The whole painting was done really quickly, without any preliminary drawing, using a 1" flat wash brush for all but the final details, which I did with a #16 round. Despite the mudpuddle in the middle, I love making this particular type of mess. Maybe I'll do it again with some proper perspective drawing and better detail. Meanwhile, I had a really good time just splashing around! I've been otherwise quite busy lately, but am nearly caught up and back to normal. We have a vacation in the works, which may mean for some interesting drawing / photography opportunities. We'll see!